Info "Polish the ball until its true beauty underneath shines through!" Round It Out is one of Penny's microgames in WarioWare Gold. The player must shake the system to polish an object. 1st level difficulty: The object is a watermelon that only takes a few rubs to polish. 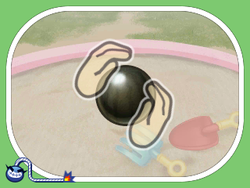 2nd level difficulty: The object is a globe that takes more rubs to polish. 3rd level difficulty: The object is a moon that takes many rubs to polish. This page was last edited on March 14, 2019, at 20:49.